Fashion means a lot of things to different people. For some, it is about expressing their thoughts and feelings while making a lasting statement. Some fashion items might be regarded as weird for a number of people while others find it stylish. Well, the key to knowing a fashionable person is in how they manage to look effortlessly stylish no matter what they wear. In recent times, ladies love to make bold fashion statements and this might involve them wearing revealing outfits. This however, is not the case for everyone. Some female entertainers have shown that they can still be covered and stylish. Recently, some people have regarded the head scarf as a sign of oppression because they feel it subdues women. Many others however see it as a fashionable item that can be rocked elegantly. 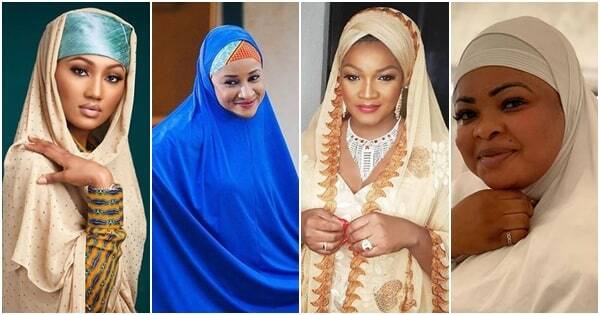 We gathered six photos of some celebrities looking gorgeous in hijab. ALHAMDULILAHI 🙏📿 #Ongoing 7th Lateef ul AKBAR at the TBS Main Bowl. This is strictly for my die hard fams. You will come to my page and leave positive comments. You will see my story elsewhere and leave positive comments…typing I LOVE YOU LIZZY. It means a lot to me. Some of you will even PRAY for me. Some of you repost my posts and celebrate me when I don't even buy you data nor phones . Some of you appreciate my struggles than some claimed friends and fams..That hand you use in typing such positive and courageous comments, you will not use it to bury any of your child/ren and am telling you that all your helpers will not rest until they locate you and bless you Insha Allah. Lizzy Anjorin Cares HAPPY SUNDAY MY ADORABLE FAMILY . Visit @ LIZZY ANJORIN CLOTHINGS is situated @ ROAD 5, SUITE i323, IKOTA SHOPPING COMPLEX, VGC, LAGOS. OUR SERVICES AS FOLLOW;- *We buy and sell REAL GOLD – strictly 18 Karats *WEDDING RINGS GOLD &ZARCONIUM GOLD *ZARCONIUM CROWN FOR QUEEN OR BRIDE *SCARFS MADE WITH RAW FIBERS *SENEGALESE *SAUDI /ARAB FULL COSTUMES FOR BIGBOYZ *PREMIUM FABRICS AND PRINTS *MALE AND FEMALE TAILORING AND STYLING *ABAYA‎ *JALABIYA *SENEGAL AND GAMBIA EMBROIDERED *FABRIC STUDDING‎ *GANILA AGBADA – BUBA AND SOKOTO *BROGADE AGBADA – BUBA AND SOKOTO *PLAIN ITALIAN COTTON AGBADA *ASO EBI..GELE & IPELE ..FULL ASO EBI FOR BRIDE & GROOM *MAKEOVER *PHOTOGRAPHY *FULL VIDEO COVERAGE WITH DRONE *EVENT PLANNER For enquiries; Call: 08027546250, 07055555861. Although I was born Muslim… Today I practice Christianity However, growing up in Kaduna … I've witnessed some horrors that eyes should Never see… All because of Religious divides and intolerance… Our Faith should make us better Humans… Any Act that does not show love does not serve God or Humanity. Love your Neighbour …. AS YOURSELF. Peace. That #MuslimChristianOndokadunaLagos girl. We cannot over emphasize how much we love Adesua Etomi -Wellington (@adesuaetomi ) here at Inkblot. The very talented Adesua plays Zainab in our new film #UpNorthFilm #UpNorthTheFilm- Which BTW is the fifth film we will be working together on. December 28,2018. We cannot wait.